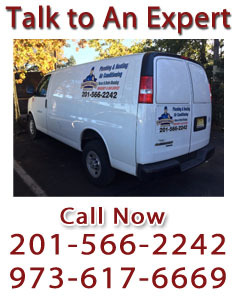 Are you in need of heating repair in Bergen County, NJ? With more than 50 years of experience, Professional Service's technicians have the knowledge for heating repairs in commercial or residential properties. We are committed to customer service, so you can rest assure your heating system will keep you cozy for the colder months coming up. When was the last time your HVAC system got checked up? Maintenance should be done regularly to avoid last minute rush, especially during winter. You might think your HVAC system doesn’t need any repairs but what if you are wrong. If there is any one time that you fired up your furnace, and it took longer than usual, or it did not respond as you expected, then there might be a problem that needs to be checked. Maybe after some time it heated up and functioned but what was the delay all about? This is the question that all the heating repairs strive to address. Heating repair in Bergen County, NJ should be done by professionals from a company that has handled them before correctly. You might have an old furnace, but it doesn’t work as it is expected and you feel like getting rid of it. Professional Service will come and assess the heater first before giving you a straight option to go ahead and replace it. It might have some life left, and even if replacement is still an option, there might be other options which our expert heating technicians can recommend. At Professional Service, our heating repair experts will come to inspect and troubleshoot the issues affecting your furnace as quickly as possible. We also offer customized recommendations for your heating system that will save you money and energy. Sometimes there might be issues in your heating system, but no one had detected them. Our heating technician will thoroughly check and repair small problems that other technicians might have looked over. Don’t get a company that solves one problem for you and leaves the other problems lying there. The next visit a heating repairs technician pays you should not be to fix the heating system again. The heating repair experts at Professional Service will tackle your simple or complicated heating repairs in a timely manner and for an affordable price. For more information about our heating repair in Bergen County, NJ or any of our other services, call Professional Service today. Professional Service- Your trusted source for heating repair in Bergen County, NJ!